Which Berkey Water Filter should I Buy? 1. How many litres of water do you consume per day? This is the most basic question to ask when choosing a Berkey filter system. We commonly hear the advice that people need to drink eight glasses of water per day. That works out to about 1.5 to 2 litres. Of course, an individual’s actual water needs will vary greatly depending on the type of activity that he or she is engaged in and also on the climate. You should consume more during hot weather or if you are very active or elderly. Besides water for direct consumption, most families will prefer to use filtered water for cooking as well. As a general rule of thumb, cooking with water from your Berkey water filter basically doubles your use, to about 4 litres per person per day. Customer feedback from the US indicates that most families will use about 1 gallon of water per person per day – that’s about 3.8 litres per person per day. So using the above a a guide, a family of 4 will require between 8 to 16 litres of clean water per day. 2. What is the holding capacity of the Berkey filter system? The bigger the holding capacity of the Berkey water filter system, the more reserve you will have for peak consumption needs. For example, imagine if you had a Travel Berkey (which holds 5.7 litres) and while you were cooking dinner on a hot day, your children came in the house after being outside with their friends. Together, the children drank six 8-ounce glasses of water (1.5 litres). You still need to make iced tea (3.5 litres), and you need water to boil pasta (3.5 litres). To accomplish all of that, you’ll need a total of 8.5 litres of water. Your Travel Berkey only holds 5.7 litres. In this situation, a Big Berkey, which holds 8.5 litres, will be the better option. In other words, you want to make sure the holding capacity of the filter system you choose is big enough for your peak water consumption needs. The table and chart below shows the holding capacity of the various models of Berkey water filters. 3. What is the flow rate of the different Berkey water filter systems? The flow rate depends on 2 factors: (a) The total number of filter elements, and (b) the size of the system. The more filters your Berkey water system has, the faster your unit will produce water and the faster it will recover from peak or sustained water usage. All the Berkeys (except the Go Berkey) that we sell come standard with 2 Black Berkey filter elements. The Big Berkey, Royal Berkey and Berkey Light can hold up to 4 filter elements. The Imperial Berkey can hold a maximum of 6 filter elements, while the Crown Berkey can take up to 8 filter elements. The bigger systems are taller and therefore generate more water pressure. This will also increase the flow rate. 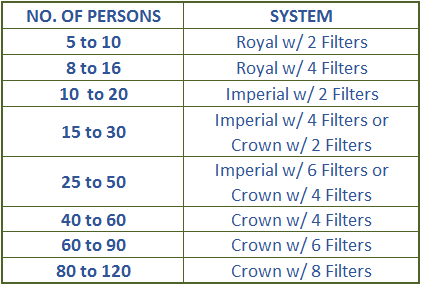 The numbers shown on the Berkey water filter comparison chart below are for when the unit is completely full. The flow rate will decrease as the level of water in the upper chamber falls. 4. What size Berkey system would be best for my needs? In determining which Berkey water system to purchase, keep in mind that while the bigger systems produce more water, the smaller systems are more portable and hence easier to handle and operate. Based on customer feedback and field testing, the table below shows the maximum number of people that each system would support under normal conditions. If you feel that your water needs are greater than normal or if you plan on using the Berkey water filter for emergencies or anything other than drinking and cooking, we suggest that you purchase a bigger system than indicated on the Berkey water filter comparison chart below. All units produce the same quality of water.